What is Parit (Rabeprazole) used for? Parit (Rabeprazole) is used to treat stomach ulcers. Its mechanism of action is based on the proton pump inhibition. In other words, Parit (Rabeprazole) reduces the production of hydrochloric acid by the stomach cells. This type of treatment is prescribed to fight Helicobacter pylori, which is the major reason of the ulcer disease. The level of acid suppression depends on the dose. After the treatment, the hydrochloric acid production is restored to the initial levels. Gastroesophageal reflux disease (stomach acidic contents coming back up into the esophagus). How should I use Parit (Rabeprazole)? 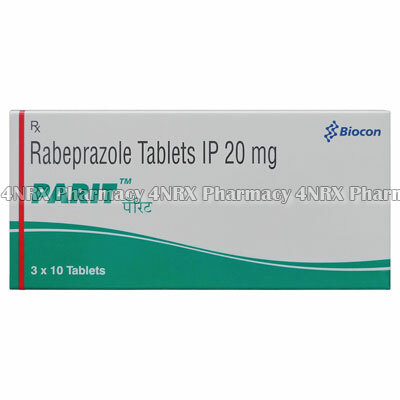 Parit (Rabeprazole) is manufactured in tablets, each tablet containing 20mg of the active ingredient. In every individual case, the dose, the time and the duration of treatment should be prescribed by the physician. Normally, Parit (Rabeprazole) is taken once daily, in the morning. The duration of treatment depends on the condition of the patient and of the patient`s digestive tract mucosa and may last up to several months. It`s important to understand that this medication is symptom oriented; meaning that it affects only one aspect of digestion and only as long as the patient is taking it. The time when the stomach acid level is suppressed should be used to restore the condition of the stomach or duodenum mucous membranes with other methods. What are the side effects of Parit (Rabeprazole)? Treatment with Parit (Rabeprazole) may be accompanied by side effects, such as digestive disorders: diarrhea, constipation, flatulence, and nausea, among others. Adverse events, associated with the nervous system, are also possible and may include nervous system depression, fatigue, sleep disorders, and others. Some patients may develop flu-like syndrome, muscle pain, cramps, rhinitis, and cough. Allergic reactions may occur as well.